Hummingbird Haven Feeder. Unique Easy to Clean Tray Feeder. The Songbird Essentials Hummingbird Haven is the easiest to clean feeder that you will ever own. Top fill port for easy refilling, without having to remove the lid. Unique raised perch features two rain gutters. Holds 16 oz. of Nectar. Bright red feeder color attracts Hummingbirds. These are the best quality hummingbird feeders I have ever seen!! Thank you for an excellent product. We love these hummingbird feeders. They are well made, a great design, easy to fill and its super that they are made in the USA !! No more cheap, thin, fiddly plastic feeders. We expect many more hummingbirds this summer because of these feeders. I am buying more of your feeders to give as Easter gifts for our grandchildren. I love the new 360 degree feeders and the brushes. The new feeders are so easy to clean and the brushes help tremendously. Thanks for having great products. My hummingbirds thank you, too. 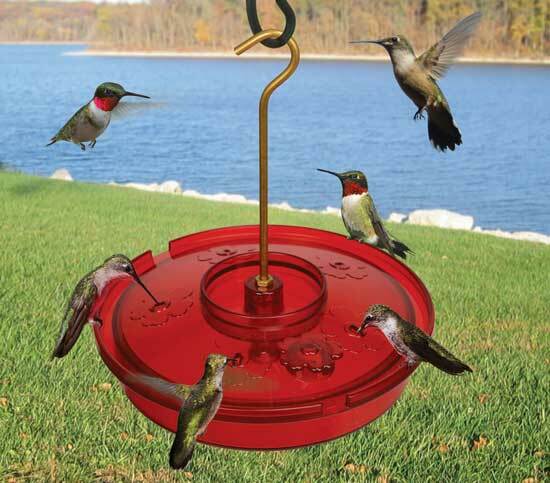 The Hummingbird Haven Tray Feeder is wonderful. I love how easy it is to fill and clean.